Betty Spruill Pledger, 82, of Columbia died Sunday, March 17, 2019, at her residence in Columbia surrounded by her loving family. Born November 24, 1936 in Tyrrell County she was the daughter of the late Noah Walton Spruill and Mae Furlough Spruill and was preceded in death by her husband, John Arthur "J.A." Pledger; sisters, Mary Alice McCutchan and Della Swindell Spruill; brothers, Jack Spruill and Bobby Spruill. 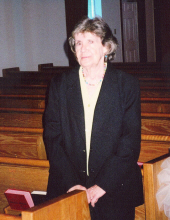 Betty retired as a tour guide with Somerset Historic Site and was a member of Christ Episcopal Church. Her family includes her daughter, Kay Pledger Voliva and husband Gary Lee of Columbia, N.C.; son, Johnny Pledger of Chesapeake, VA.; daughter-in-law, Brenda Styons Pledger of Columbia, N.C.; sister, Joyce S. Elliott of Chesapeake, VA.; brothers, Noah "Buddy" Spruill, Jr. and Sterling Spruill both of Virginia Beach, VA. and Frankie Spruill of Camden, N.C.; grandchildren, Garrett Lee Voliva, Heidi Voliva Nguyen and Nikki Pledger Galzerano; great grandchildren, Mackenzie Marie Voliva, Madeline Elizabeth Voliva, Chloe Sophia Nguyen and Adalyn Mae Galzerano. Funeral service will be held Thursday, March 21, 2019 at 2:00 pm at Maitland Funeral Home, Creswell with Bob Moulden officiating. Burial will follow in Azalea Memorial Gardens. Family will receive friends on Thursday, March 21, 2019 from 12:30 to 1:30 pm at Maitland Funeral Home, Creswell prior to the service and other times at the residence of her daughter-in-law Brenda. "Email Address" would like to share the life celebration of Betty Spruill Pledger. Click on the "link" to go to share a favorite memory or leave a condolence message for the family.